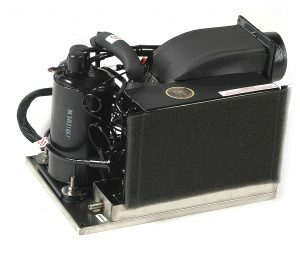 With a cooling capacity of 800 cubic feet, our 9,000 BTU unit is designed to cool/heat up to a 30′ cruiser or a 32′ sailboat. 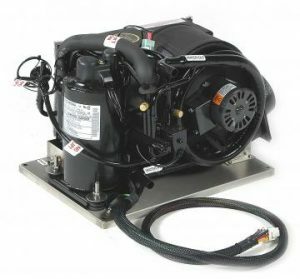 This unit, the smallest 9,000 BTU on the market. It is almost the same size as the Mermaid M6 unit. In order to keep the smallest footprint on the market, we utilize the same stainless steel base as the Model M6 – 6500 BTU unit. This unit will run off of a Honda 2000 generator. 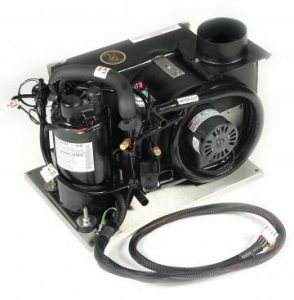 This unit is available in right, left, or top air discharge configurations, and is available as a “Cool Only,” “Cool/Electric Heat,” or “Cool/Reverse Cycle Heat.” We use a 6″ and 4″ ducting and recommend a minimum of three 4″ round supply grills with this installation. calculated by running amperage multiplied by 1.8.